Imagine laying on the sand with miles and miles of soft ground ahead of you and waves crashing at your feet, doesn't that sound amazing? Colombia, a country split between the Pacific Ocean and the Caribbean Sea, is blessed with some of the best beaches you'll ever visit. With a coastline spanning well over 3,200 km, Colombia's seaside is known for its remarkable beauty, biodiversity and culture. There's a beach for everyone — from paradise islands to local favorites and hidden gems along the way. 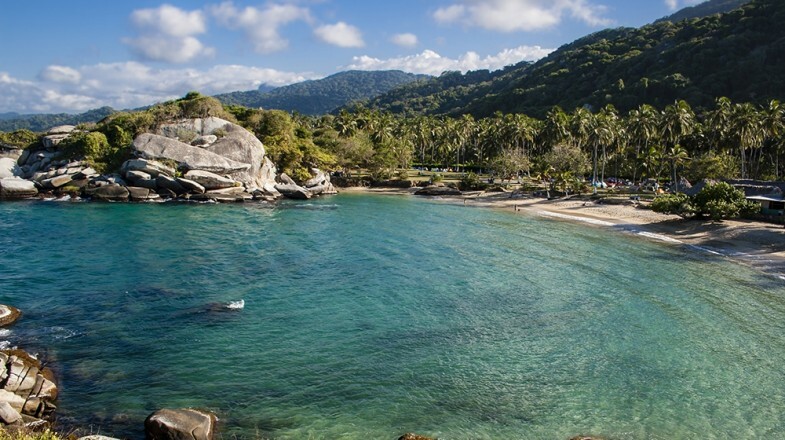 Here are the 10 best beaches in Colombia for your next adventure! Located on Isla Barú, Playa Blanca sits just 40 minutes from the city of Cartagena. A small jungle-covered island that overlooks the Utria Inlet, Playa Blanca is one of the most popular beaches on Colombia's Pacific Coast. 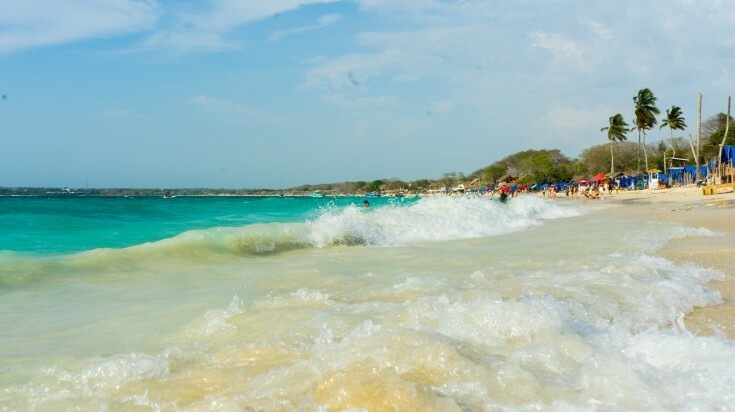 The island is home to some of the tastiest local dishes, and humpback whales make a yearly appearance from July to October.Located on Isla Barú, Playa Blanca sits just 40 minutes from the city of Cartagena. A small jungle-covered island that overlooks the Utria Inlet, Playa Blanca is one of the most popular beaches on Colombia's Pacific Coast. The island is home to some of the tastiest local dishes, and humpback whales make a yearly appearance from July to October. Bus and bike: If you're on a budget, take a bus from the statue of India Catalina in Cartagena to the town of Pasacaballos. From there, take a motorcycle taxi directly to Playa Blanca. Boat: If you want speed, then getting to Playa Blanca by boat is your best option. 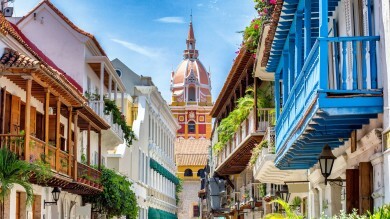 Grab a bus to Mercado Bazurto in Cartagena, and you'll find authorized transportation companies on the Bodeguita dock. Choose one of your liking and, with some great negotiation skills, you can ride off to Playa Blanca in 45 minutes. Best time to visit: All year! For a less crowded experience, avoid the weekends and visit during the early hours of a weekday. Go for: The turquoise blue Caribbean waters and white sand. Take an afternoon nap, have some coconuts and get a tan. Off-the-beaten-track and relatively cut off from the rest of Colombia lies Nuquí, a small fishermen town to the west of Chocó. Nuquí is home to Playa Guachalito, a beach that tempts travelers looking to isolate themselves from the crowds of people that visit Colombia. Nuquí is one of the rainiest areas in the world but don't let the rain stop you from exploring Playa Guachalito. This beach is known for its undisturbed landscape, sealife and dark sand that extends along the coast. How to get there: You can take a direct flight to Nuquí from Aeropuerto Olaya Herrera in Medellín. The small propeller plane will take you to Nuquí in 40 minutes. Enjoy a panoramic view of the vast coastline and ocean with few tourists in sight. Best time to visit: July to December, when you can combine your time at the beach with some whale watching and surfing that Nuquí is known for. Go for: The quiet, untouched sand and to truly connect with the locals! Bright orange sand and green limestone bases with the world's most vibrant turquoise waters at your feet is Playa El Pilón de Azúcar, one of the most spectacular beaches you'll find in Colombia. Nestled at the base of two hills on Pilón de Azúcar, Playa El Pilón de Azúcar is a small desert beach at the end of the Guajira Peninsula, located 30 minutes from Cabo De Vela. The beach boasts a beautiful cove rich in desert hues of yellow, orange and red. The area is surrounded by interesting land formations like sand dunes, cliffs and hills. How to get there: Take a motorbike from the fishing village of Cabo De Vela. Just be sure to organize a time for your driver to pick you up as well (or it's a long walk back to Cabo De Vela). 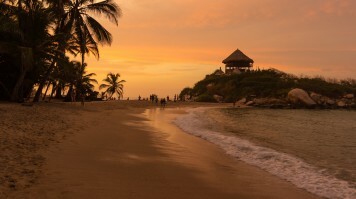 Go for: The orange sand and desert landscape that is unique to this region of Colombia. A 4 km stretch of unpopulated sand, Costeño Beach offers the best surf conditions on Colombia's Caribbean coast. Just 5 km away from the renowned Tayrona National Park, Costeño Beach gifts travelers with seclusion and peace, something its neighbors at Tayrona are slowly losing due to tourism. How to get there: Catch a bus to Palomino from Santa Marta's main market and get off in the town of Guachaca. Look for a sign on the side of the road that points you to the beach. Go for: The big waves and surfing. Catch lessons at the eco-lodge and surf camp or rent a board in time to ride the waves. 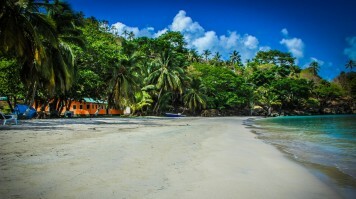 225 km off Nicaragua's Atlantic Coast is the small Colombian island of Providencia, known for some of the most beautiful and unspoilt beaches in the country. Providencia is largely protected and free of large-scale buildings, instead mostly surrounded by sand, palm trees, and mangroves. Wander to the edge of Playa Manzanillo on the southeast coast of the island, or take a stride over to Bahia Sur Oeste, Providencia's longest beach that serves some of the island's best seafood. Be sure to make your way to Bahia Maracaibo, found on the east side of the island, to catch a glimpse of the Providencia's most beautiful landscape. Here you'll find McBean Lagoon, McBean National Park and Crab Caye with waters perfect for both canoeing and snorkelling. Flight: A flight from San Andrés will take you directly to Providencia's El Embrujo Airport in 20 minutes. Ferry: Catch the catamaran ferry service from San Andrés that runs six days a week. 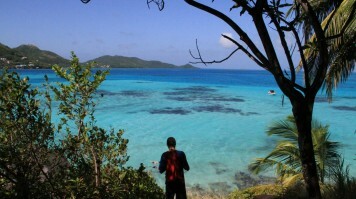 The trip will take you to Providencia's dock in a little over three hours. Best time to visit: Late April or early May to catch the black crabs that ascend ashore to lay their eggs. Go for: The ultimate beach hopping experience, all on one island! 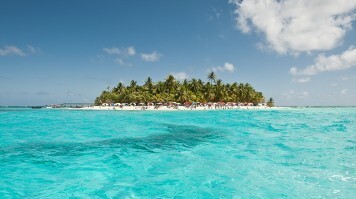 On the seahorse-shaped island of San Andrés is the protected four-hectare coral islet known as Johnny Cay. 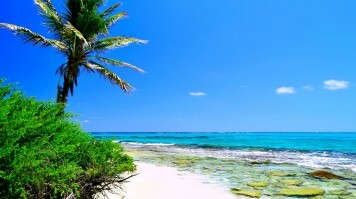 Covered in coconut plantations, Johnny Cay is home to easily one of the most famous beaches in Colombia's archipelago. Johnny Cay boasts huge coral formations and lush vegetation scattered around the edges of the isle, plus shallow waters perfect for snorkelling. Find a seat at the wooden shack-styled restaurants and bars that caress the coastline and grab lunch while swaying to reggae music that echoes along the beachside. How to get there: Take the boat from San Andrés Town and get to the beach in under ten minutes. Best time to visit: The dry season of January to April, perfect for sunbathing and snorkelling. 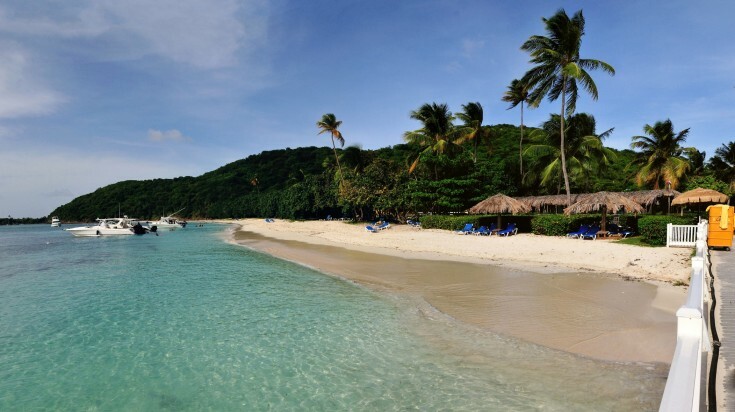 Go for: The azure Caribbean waters and sugar-white sand. 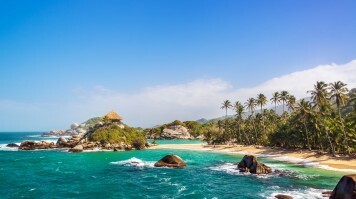 Located in Tayrona National Park is El Cabo San Juan, a beach formed around lagoons and tropical jungles on the northwest coastline of Colombia. By far one of the most iconic beaches in Tayrona, El Cabo San Juan is known for its stunning setting, soft sand and popular campgrounds. El Cabo San Juan sits between two beaches that mirror each other under the foot of the Sierra Nevada mountains and serves up a fantastic view of the sunset over the mountainside. How to get there: Board a plane and fly to Simón Bolívar International Airport in Santa Marta before catching the bus from the Santa Marta bus terminal. You'll find El Cabo San Juan soon after the entrance to the park. Go for: The campgrounds that attract locals and travellers from around the world. Make sure to find a spot and stay a night or two to truly soak in the experience. 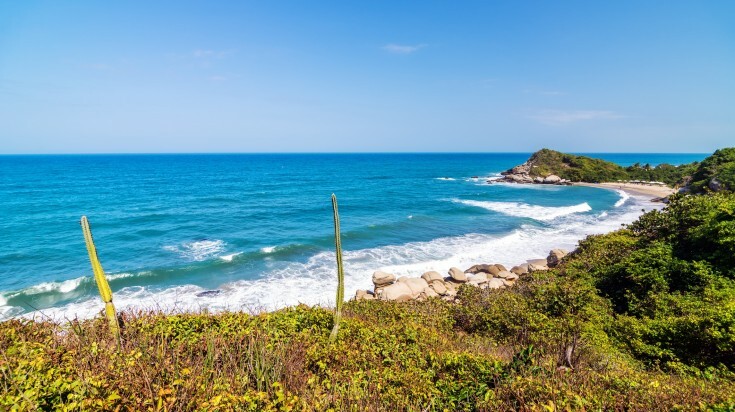 Also located in Tayrona National Park is Cañaveral, a beach that is much narrower than the rest of the park's beaches. While the water at Cañaveral is not safe for swimming, its long stretches of sand are best of those late-night strolls and stargazing. How to get there: Fly to Simón Bolívar International Airport in Santa Marta before catching the bus from the Santa Marta bus terminal. It'll take you right to the park. Go for: Camping in the Ecohabs — a contemporary take on the traditional Tairona huts that once stood in the area. Along the Colombian Caribbean border with Panama, on the edge of the Darien Gap, is the tiny town of Capurganá. 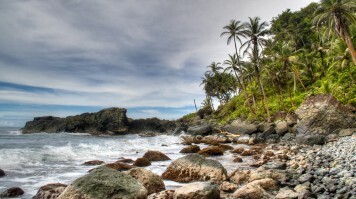 The town is known for its postcard-like beaches, dense tropical rainforests and green waters. Take a walk on Playa Soledad, Capurganá's main beach, with its stunning coves of white sand and the Darien jungle as its backdrop. This beach is ideal for snorkelling and darting in-and-out of its coral reefs. Then, continue onto Acandí beach where, if you're lucky, you might be able to spot leatherback turtles laying their eggs! 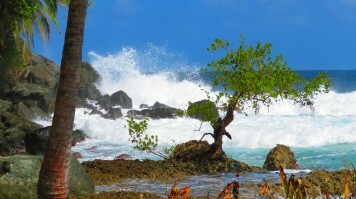 Don't forget to hop to El Aguacate (also known as Avocado Beach) for its green waters and offshore coral. How to get there: Fly from Medellín to the border town of Acandi. From there you can take a horse cart or small boat that'll get you to Capurganá in just under an hour. Best time to visit: April to November, when the sea is calmest and visibility is best for water adventures. Go for: A unique experience where the islands and beaches of South America meet Central America. If you're up for it, trek across Capurganá to Sapzurro and cross the military border into Panama where you'll find the beach of La Miel, a hidden gem of the area. 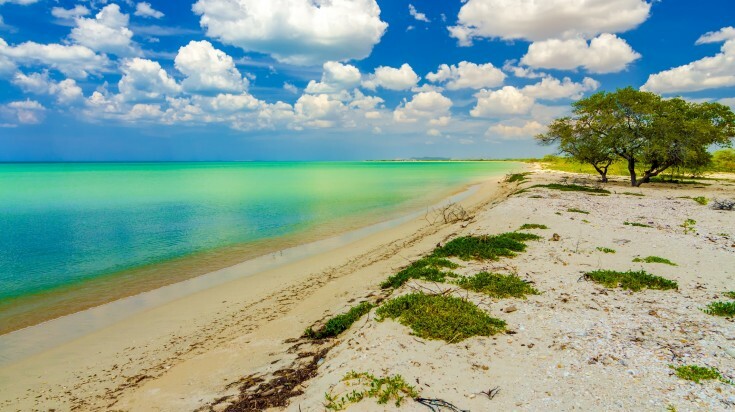 Palomino Beach can be found on the edge of La Guajira along the Palomino River, which divides the regions of Magdalena and La Guajira. There are no resorts, giant hotels, vendors or shops here. In Palomino, there's a beautiful beach and nothing more. You'll get to enjoy the beach all to yourself, talk with locals and meet the merchants that call Palomino home. How to get there: Take the bus that leaves from Mercado Publico de Santa Marta. In under two hours, you'll arrive at Palomino. Go for: River tubing! Tubes are available for rent on the beach. Grab one and make your way down the Palomino River. From the warm waters of the Caribbean to the wild Pacific, Colombia's distinctive borders make it particularly special when it comes beach hopping. Spend a day in one of the popular beaches on the coast or take the road-less-travelled and discover an uninhabited beach among the jungle. Wherever it may be, Colombia is waiting.